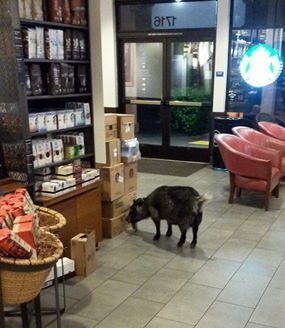 Rohnert Park, California (AP) – Police say a goat apparently needed a caffeine fix when it wandered into a Starbucks in Northern California. Rohnert Park police Sgt. Rick Bates says dispatchers received several calls Sunday morning about a goat named Millie wandering around a strip mall on the city’s eastern edge. Bates says employees who were opening the Starbucks tried to give Millie a banana, but she kept walking into the coffee shop and started chewing on a box. Bates took the goat into custody and brought it to the animal shelter – but not before snapping photos of her sniffing around the Starbucks and posting them on the police department’s Facebook page. He says word spread to Millie’s owner, and the animal has made it home. He says Millie didn’t travel far; she lives around the corner from the mall. Rohnert Park is about 50 miles (80 kilometers) north of San Francisco.